Prague (part 1: arrivals) – record of m.
Our overnight flight landed in Amsterdam before 7:00am, leaving us bleary-eyed from the few hours of dozing we managed. Thankfully, Amsterdam’s airport/train station is exceedingly easy to navigate, and we quickly got through passport control, stowed our large bags in a locker, and took the train into the city center. Amsterdam greeted us with an intermittent drizzle, which set the tone for the rest of the week. We walked from the train station to VINNIES, where we ducked into a small table in the back corner. We then had a protein-packed breakfast — eggs and bacon for me, shakshuka for Virginia — and enough coffee to get us back on our feet for the day. I grabbed an extra coffee to go, and the hot drink was perfect on a damp morning. We didn’t have any real plans, so we decided to wander around the canals for a while. We walked past the Anne Frank Museum, which was of course already sold out and packed with visitors. At that point, we decided we had time to take an hour-long canal cruise and have lunch before going back to the airport. After a little mixup on where to pick up the canal boat, we managed to find our pier and get on board. The canal cruise itself was pleasant, especially the views from our window. Unfortunately, our captain aimed to be funny and repeatedly failed. But that was a minor blip and almost forgotten by the time we got to lunch. I ordered a wine pairing and they were nice enough to give Virginia a splash of each pairing as well. The restaurant also offered excellent people-watching, as it shares space with a co-working facility and the people working upstairs all came down with a chit for a one-dish lunch. After finishing lunch, we returned to the train station, headed to the airport, and got back on an airplane for the short hop to Prague. Farewell Amsterdam; we’ll be back. Once we arrived in Prague, we were almost completely spent. We took a car to our hotel in New Town, which seemed interminable but in reality was about an hour. After checking in and unpacking, we walked to Madame Lyn, a Vietnamese restaurant Virginia had previously identified as good and nearby. We shared chicken skewers with peanut sauce, and then had pork and sausage with noodles (me) and duck curry (Virginia). Back to the hotel and almost immediately to sleep to reset. You know the feeling when you wake up with a symptom and realize, “uh oh, I’m going to have a cold”? So I woke up with a sore throat, which is always my first cold symptom. Excellent. In addition to that, we both were a little run down from the previous day’s travels so we got a late start, having breakfast after 9am. 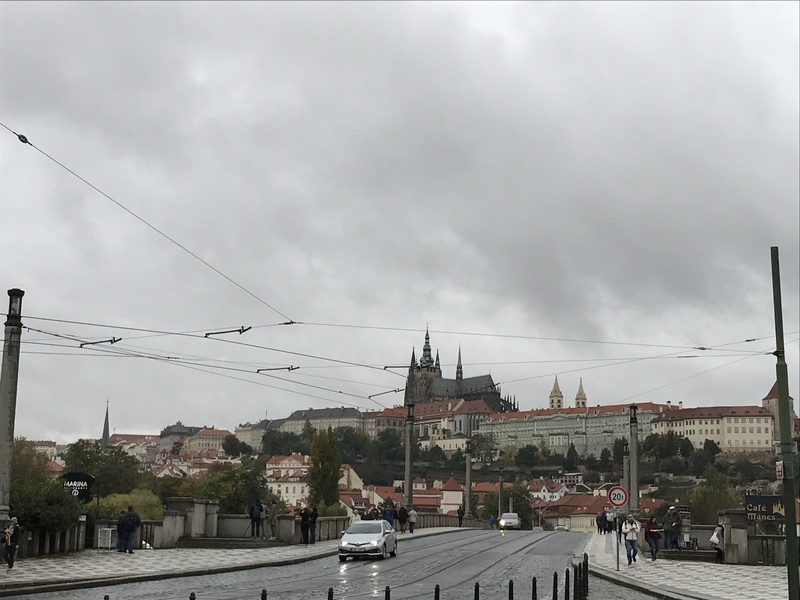 We then headed out into the drizzly weather in search of a place to purchase the Prague Card, which we would use for the next few days for transportation and museum entry. (Review: the Prague Card is a deal if you’re visiting 4-5 museums per day or if you’re there during high tourist season.) Virginia read that we could pick up cards at the Muzeum train station, a ten-minute walk. We got there and searched the station twice without any luck. Finally I found what used to be an information booth that told us we needed to go to Mustek to buy cards, maybe ten minutes further away. Back into the cold weather to walk down Wenceslas Square and find the station. And at last, we could buy our three-day cards. By now, we were solidly in Old Town, our intended destination for the day. So we used the cards to visit the Jewish Museum in Prague, which isn’t a single location. Rather, you can visit several historical synagogues and the Old Jewish Cemetery on a single ticket. We started at the Spanish Synagogue before walking through the Old Jewish Cemetery to the Pinkas Synagogue. Inside, the walls inside were covered in an installation of names of Jewish people who died during the Holocaust. Though overwhelming, we felt even more impact by a children’s art exhibit upstairs. Here, we saw pictures drawn by children at the Terezin ghetto, often a staging point for other concentration camps. Adults had tried to fashion a normal life for the children, but you could see in the art how brutal reality seeped through their attempts. After that, we stayed in the area to have lunch at Kafka Snob Food. Frankly, we over-ordered by both of us having a wonderful bean and ham soup followed by a solid tomato and zucchini pasta. But it was nice to escape the weather for a bit, get some hot food and coffee in us, and rest our feet. After lunch, we walked to Old Town Square so we could see the Astronomical Clock. We then realized our Prague Card got us into the Old Town Hall Museum, so we ducked inside away from the crowds. We wandered through the building, which included a large audience hall and several large meeting spaces, and then left for our only scheduled tour of the trip. Virginia booked us for a food tour of Old Town and New Town as a way of getting us acquainted with the city (and getting some great food). We met Jan, our tour guide, and the other six people on the tour in front of La Degustation restaurant (where we’d be a few days later) for a brief history lesson in Czech cuisine before our first real stop. (Short version: Czech food arose from the Austro-Hungarian empire before being trampled by Communism and Soviet occupation. Only now is it emerging from the past and moving forward.) And off we went! Everything was outstanding, and we used their foodie guidebook for almost everything we ate from that point forward. I managed to push through, even with cold symptoms, but by around 8:30pm it was time to retire for the night. We bade Jan and our fellow guests a good night and headed back to the hotel. Previous I (kinda sorta) love LA. Pingback: Prague (part 2: a cold in the cold) | record of m.